Health Coverage Guide Jesse Lopez of the Aurora Coverage Assistance Network, left, talks about healthcare with Pedro and Milda Quintanar during a Latino enrollment event at Escuela Tlatelolco in Denver on March 15, 2014 . This time last year, news coverage of Obamacare was shifting from the broken HealthCare.gov website to the question of whether enough people — and the right people — would sign up to make the insurance exchanges set up under President Obama’s health care law work. Now, as we enter the final month of the second open-enrollment period of the Affordable Care Act (ACA), the numbers look good, with the government on track to surpass the year’s signup goal of 9.1 million people. Young adults and Latinos are particularly important groups for the enrollment effort. While we have data on young adults (35 percent of people who enrolled in the second period are currently under the age of 35, beating out last year’s 28 percent1), understanding Latino enrollment has been more challenging. Latinos are a key demographic. While they make up about 18 percent of the U.S. population, they accounted for more than 30 percent of the uninsured before the ACA kicked in. These 15.5 million uninsured Latinos are also relatively young and healthy, meaning they can help balance the makeup of enrollees on marketplace insurance plans, keeping prices down for everyone. After last year’s first enrollment period, Latinos made up about 7 percent of enrollees on the federally run marketplaces, according to the Department of Health and Human Services. That’s a lackluster showing considering the number of them who were uninsured. Last Tuesday, the department announced that the Latino share had climbed to 10 percent by mid-January. Only two-thirds of enrollees answered the optional question on race/ethnicity on the enrollment form, so these numbers are to be viewed with caution, but it does look like the share of people purchasing insurance on the marketplace who are Latino is going up. The marketplace is just one aspect of the ACA designed to expand health care coverage. The other main pillar is the expansion of Medicaid, the government-sponsored insurance program for low-income Americans. Unfortunately data hasn’t yet been released detailing what percentage of expansion enrollees are Latino. There are clues, however, to how many people have gotten insurance so far. 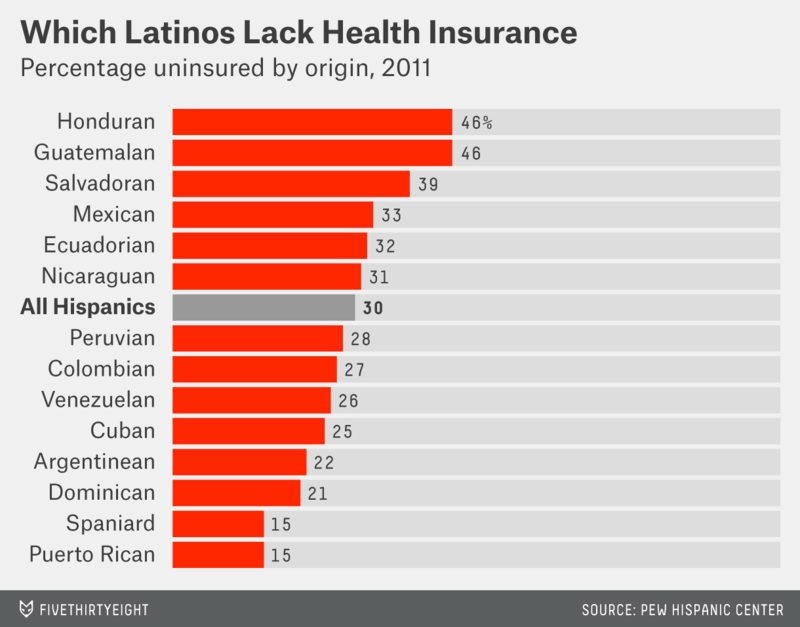 More Latinos have coverage now, but they are still the most uninsured group in the country. Using census data collected after the first enrollment period, the Pew Charitable Trusts found that one in four Latinos is uninsured, down from 32 percent before the law. A poll released Thursday by the Kaiser Family Foundation said that before the second enrollment period opened in November, 30 percent of the uninsured were Latino — the same share as before the law kicked in. For all the polling and research we do, it’s really hard to know exactly who the uninsured are, and where to find them. This seems to be especially true of uninsured Latinos. Unlike elections, where parties, candidates and local consultants have detailed spreadsheets of voter registration and voter activity, when the ACA began, there was no database of the uninsured. Groups promoting enrollment had to forge their own paths (which is why HHS gave grants to local organizations that ostensibly would know how to reach the uninsured in their communities). Enroll America is one of the largest of these outreach organizations, and its data collection has been unique (for starters, it works with some of the data-handlers behind Obama’s election campaigns). By gathering data from the census and borrowing practices from big marketing companies, Enroll America created a map to find the uninsured. (“Bed Bath and Beyond knows where I’ve moved before my mom does,” Matt Saniie, the group’s national director of data and analytics told me, noting how good marketers are at finding their target audience.) During the first open enrollment period, Enroll found its model was largely successful at locating the uninsured (as The New York Times detailed back in October). So I asked if the data revealed anything about where to find uninsured Latinos specifically, and Enroll’s data team shared with me what they’ve learned. 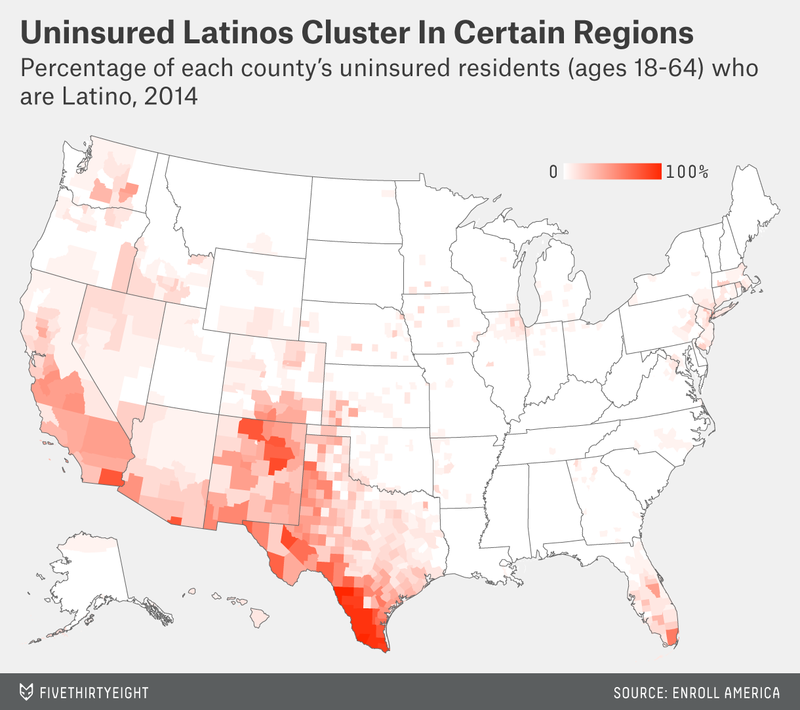 Unsurprisingly, they found high concentrations of uninsured Latinos in the big cities of Texas, Florida and Arizona. But the data also led them to focus on groups in rural areas, where uninsured rates are high, health literacy is low and health access has been limited, including parts of Tennessee, North Carolina and northern Georgia. While most of Georgia’s outreach apparatus is in greater Atlanta, pockets of uninsured Latinos near the state’s northern border turned out to be just as important targets for reducing the rate of uninsured people in the state. 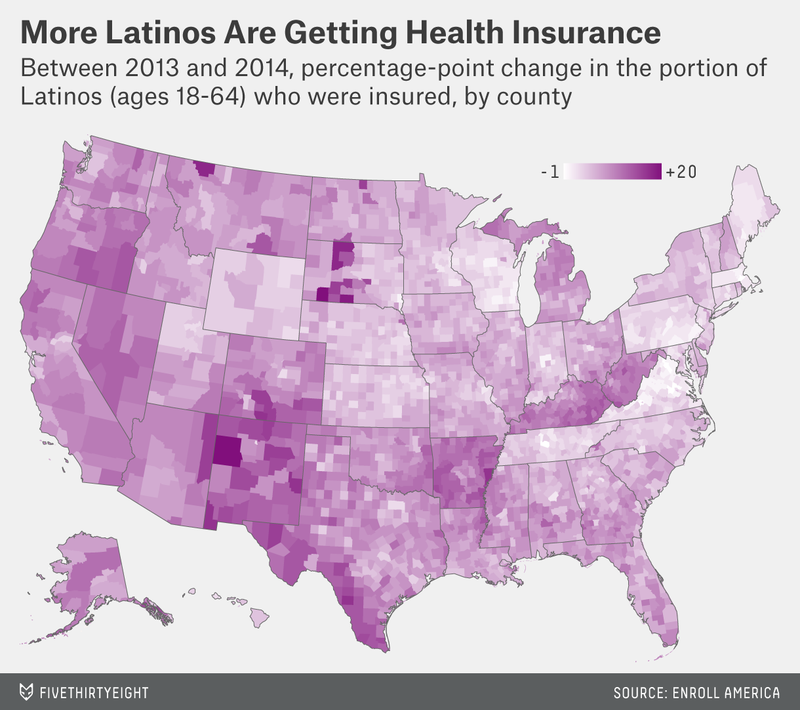 But there are other ways to think about uninsured Latinos in the U.S. aside from geography. Age, employment, income — and for Latinos specifically, country of origin, country of birth and immigration status — are all important factors. More than half of people under 64 get their insurance from an employer.2 While Latinos are only somewhat less likely than the general population to have a full-time worker in the family (73 percent compared to 80 percent, according to the Kaiser Family Foundation), they were much less likely to have jobs that offered insurance or paid well enough for them to afford private insurance before the ACA. Where 71 percent of the general population had private insurance in 2013, only 39 percent of Hispanics did, according to the Kaiser Commission on Medicaid and the Uninsured. Among the uninsured — a relatively poor group — Latinos are among the poorest, which creates some hurdles for them when trying to qualify for insurance. Jose Plaza, national director of Latino engagement for Enroll America, explained that many Latinos have no credit history, or have always lived in poverty. That makes it difficult for Experian, the company charged with verifying identities for the health care marketplace, to do its job. “If you’re bankless, if you’re below the poverty line, we’ve seen some issues with Experian being able to verify your identity,” he told me. “The wait is longer, you have to send additional information.” The same goes for immigration status, making enrollment particularly onerous for many Latinos. When the Affordable Care Act was written, it was assumed that everyone earning less than the federal poverty line would be eligible for Medicaid. Federal subsidies for insurance purchased on the marketplaces were reserved for people earning between 100 percent and 400 percent of the poverty line. When the Supreme Court decided that the Medicaid expansion was up to the states, millions of people were left both ineligible for Medicaid and too poor to buy insurance on the marketplaces without subsidies. The term “Hispanic,” historically used in most polling and data-gathering, describes a heterogeneous group that includes indigenous migrants from Central America, Puerto Rican families who’ve lived in New York for generations, Argentineans of European descent and many others. Insurance rates vary widely across these groups. According to an analysis by the Pew Hispanic Center, nearly half of people of Honduran and Guatemalan origin lack insurance, compared to 15 percent of Spaniards and Puerto Ricans. Plaza says different groups need different kinds of outreach. For older Latinos in southern Texas, this might mean help signing up for an email address and with logins and passwords. For Dominicans in New York and New Jersey, the focus is on explaining resources available under the law. Where a person was born also matters. The same Pew study found that foreign-born adult Latinos are twice as likely to be uninsured as U.S.-born Latinos (foreign born includes the undocumented, but that doesn’t fully account for the difference). So who is getting enrolled? Saniie said Enroll has learned many things from its field staff and volunteers. For starters, Latinos aren’t necessarily that different from other groups: Those who live in Medicaid-expansion states or are female or young are the most likely to enroll. In-person assistance is crucial for people who don’t know much about health insurance, as is often the case in largely uninsured Latino communities. Both Alvarez and Plaza point to a greater feeling of ease among Latinos that enrolling in the marketplace won’t harm residency applications or get their family members deported. California presents a sort of test kitchen for Latino enrollment. The state embraced Medicaid expansion and spent millions advertising directly to Latinos. If California could reduce the number of its uninsured, then the law might actually work as intended elsewhere. Although more than half of California’s uninsured were Latino before the ACA went into effect, the number of uninsured Latinos seems to have diminished dramatically. An in-depth, longitudinal survey by Kaiser followed the state’s uninsured before and after enrollment and found that about half of uninsured Latinos enrolled in coverage during the first year. Among them, 12 percent were added to the rolls of their employer, 24 percent signed up for Medi-Cal, the state’s Medicaid program, and 6 percent got coverage through the state’s exchange, Covered California. The exchange (which has been more forthcoming with data than the federal exchange and those in other states) said that after the first year, 28 percent of marketplace enrollees were Latino, though they make up 38 percent of eligible Californians. In the second year, Latino interest in the exchange may have jumped. According to the most recent report, 50 percent of people determined eligible to purchase a plan were Latino. But among people who took the next step and actually chose a plan, the Latino percentage remained steady at 28. Last year saw a 30 percent increase in Latino enrollment during the final month of the enrollment period. If that trend holds this year, California could be on track to reduce the disproportionate share of its uninsured who are Latino. But with the undocumented representing 13 percent of the state’s uninsured, it could take new legislation, in the form of a new insurance stream for the undocumented or an act of Congress, to get the numbers where officials want them. CORRECTION (Feb. 2, 2:35 p.m.): An earlier version of this article misspelled the name of the national director of Latino engagement for Enroll America. He is Jose Plaza, not Jose Plazo. These numbers reflect people who’ve selected a plan; we don’t yet know how many will pay the first month’s premium and actually receive insurance. Since most people over 65 have access to Medicare, I’m excluding them from the numbers in this article unless stated otherwise. The polling methodology in the Current Population Survey Annual Social and Economic Supplement, used to calculate the number of Latinos in the gap by state, changed in 2014, making it impossible to estimate the number with the same degree of accuracy as the previous year. I spoke to Rachel Garfield, author of the Kaiser report, and she told me that although Kaiser isn’t publishing exact numbers this year, the trends are the same. Enroll assigns a score to individual non-elderly adults representing the probability they are uninsured, using 40 variables (race/ethnicity is one of those variables, since Latinos and African-Americans are more likely to be uninsured). The most recent score was tested against a survey of 8,191 individuals in June 2014. The group says the model predicted the uninsured rate within 1 percentage point of the reported rate, and the model hasn’t performed better or worse for subsets like Latinos.